I've been going through our clothes this week, trading sweaters and coats for tanks and shorts. Along the way I have encountered more than a few items that are in too poor of condition to share along (please don't donate worn out/torn/stained clothes to charities), but I was pained to think of just throwing them in the garbage and sending them to a landfill. 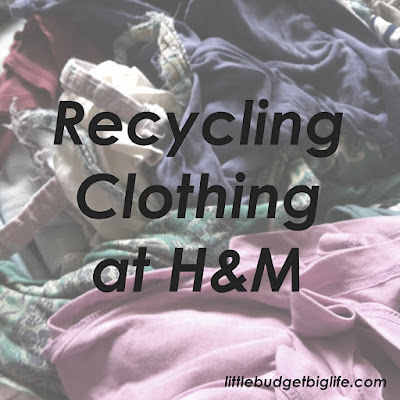 Enter H&M's garment collecting initiative! Not only will they dispose of these garments responsibly, but at the H&M store in Nashville's Opry Mills Mall, at least, they give you a discount on your purchase if you bring in clothes to recycle. Garments can be any brand, and in any condition. There's more info and a store locator on their website! Their fashionable clothing is pretty affordable, generally, and their clearance prices are often big bargains! And they're well-made, too. I found a "size 2-4Y" dress from there--at a thrift store, so I assume it had already been previously worn--for Pip when she was two years old. It was her favorite because it was so soft, and she wore it as a dress that summer, and the following summer. The next summer and the next, it was a tunic. Then it became a shirt. I am not even kidding; at age 7 1/2, that kid is still wearing that shirt!! So, bag up your worn out garments and head to your nearest H&M!